Hello and a Happy Monday to all! 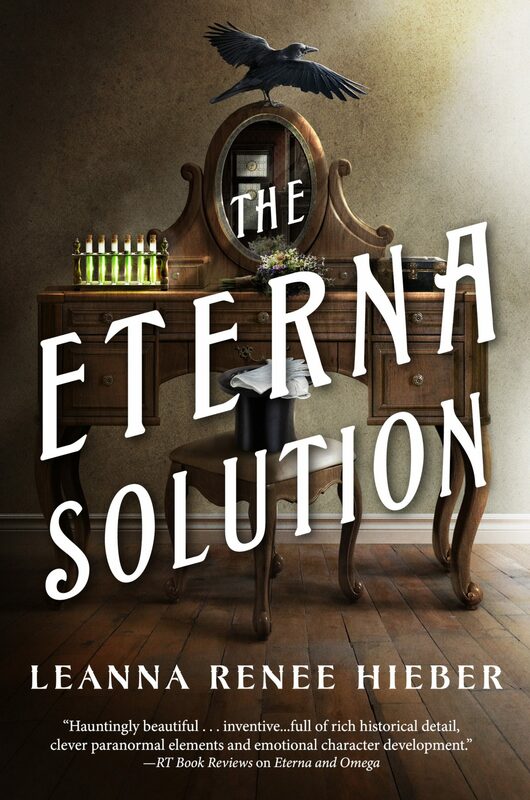 Today we are hosting the cover and exclusive excerpt from The Eterna Solution, the conclusion to Leanna Renee Hieber’s Eterna Files series, set in her Victorian gaslamp fantasy world. Clara woke to whispers and dread. The shadows of her small cabin on a cross-Atlantic steamer bound for New York were too close and the cramped space seemed even more claustrophobic than when she’d fallen into uneasy sleep. The first days aboard the packet, a vessel chosen for top of the line speed, were filled with victorious, albeit harrowing, tales as the American Eterna and English Omega teams recounted their climactic, supernatural encounters outside Parliament and those who battled the Vieuxhelles estate and saw to its destruction. The warmth of reconnecting, marveling at the strength of their colorful compatriots’ varied gifts and bravery in the face of madness was so powerful that Clara had not yet fully registered the concern for what they’d find upon their return. A gifted Sensitive from an early age, Clara’s gifts had been sharpening at an exponential rate since her lover’s death. Waking to unease, her first instinct was to call, to bid him come to her in luminous, spectral visitation and talk with her about the state of the spirit world and what she might expect, but she stopped herself. When Louis Dupris died and in doing so discovered that he had made the protective Ward of localized magic that was the Eterna commission’s great legacy, the knowledge he brought from the beyond helped Clara mend the torn, bleeding tissues of grief, giving her something to fight for and with instead, making his sacrifice meaningful. But their souls had said their goodbyes. Their story was at an end and she was, now, finally at peace with his spirit moving on to help guard his native New Orleans. For all that she might feel lonely, she was not alone. No, some other thing was awake and aware of her. The shadows across the room were not only too close, but unnaturally dark. Not one to be afraid of a resident spirit or haunt, she felt the hairs rise on her neck and arms, the familiar, unsettled twist in her stomach. Her body did not yet call for her to be on a countdown to collapse but she had to be wary, as the epileptic seizures that accosted her whenever the spectral world crossed a line from a pleasant encounter to an onslaught of something altogether malevolent was often a quick and dizzying shift. There was no remaining still any longer, so she clambered down from the upper bunk as soundlessly as she could so that Rose would not be awakened by whatever next occurred. Water was a charging and shielding element for Clara and she felt safer in the open than in close quarters when something was sniffing her out, so she resolved to seek solace and safety on deck. Throwing the skirt of her burgundy riding habit over her head and buttoning the matching jacket somewhat messily, she palmed her cabin key and quietly slipped out the wooden door, locking it behind her. The smell and tang of the salt spray on her tongue, the sea air’s moist kiss against the open collar of her bodice, were an immediate tonic. The lace panel lined with glass buttons that was meant to cover her neck flapped in the breeze, the buttons thrumming against the hollow of her throat in a rhythm that matched the cracking of the Union Jack flying above her head as she stepped further out onto the aft deck. Nothing made Clara feel so alive as the sea. Closing her eyes, she communed with at least three past lives lived most vibrantly upon the water. In doing so, she felt exhilarated and replenished. Gathering herself, renewing her psychic and spiritual shields, she breathed in the vitality of the ocean and snapped energy out from her body like a whip, breaking off the tendrils of any negative spirit or demonic murmur that had managed to cling to her after the battle in London. She spun slowly, surveying the ship and the waves around it, lifting a hand to sweep aside stray, dark blond strands of hair that wanted to experience the same freedom as her skin. In their number were a few fresh grey strands, her connection to the spirit world hastening the silvery growth. At twenty-nine, the greying was premature, but her former guardian and the true love of her life, Senator Bishop, had gone silver in his twenties and had always blamed it on the ghosts. She would too. She looked around for them, or for the worse company; demons. The shadows retained their normal angles, depth of light and expected shapes; nothing was lurking. Not anymore. But something was not right. The salty air, one of Clara’s favorite tastes, held a slight tinge of copper. Sulfur even. The foul air was one thing, the sounds were another. There was a howling off the water, something not human, but not altogether industrial, something that Clara had never heard before. She could not imagine what creation, entity, or machine could make such a noise. Clara’s mentor, the clairvoyant and ever-elegant Evelyn Northe-Stewart, exited the cabin corridor onto the aft deck, her gaze immediately pinning Clara, to whom she nodded in acknowledgement. The medium wore a thick saffron dress robe and cloak over her nightclothes. Not far behind her, Omega department’s Miss Knight, London’s lavishly theatrical psychic asset approached, her raven hair in a long braid. She wore an elaborate crimson kimono. The layers which were not bound to her person whipped behind her like a scarlet flag in the wind. The moon shone blindingly down on them and bathed them all in silver, an incredible, almost theatrical effect. Clara could not help but recall lines from Macbeth’s witches, chanting in otherworldly meter in her mind’s ear. The three Sensitives looked at one another with a mixture of confusion and fear. Clara pressed her hand to her bosom, where the protective Ward created from her late lover’s research still lay—she’d created a sort of poultice of the contents and had been loathe to remove it from her person—and felt a little surge of power for the press. Perhaps it was just a trick of the mind but it did seem to offer a bit of shield against the difficult sounds. Movement drew their attention and all three turned to see that Rose Everhart had joined them, rubbing her eyes and seeking out Clara first, as if she were an anchor. The two, born a sea apart, had found in one another the soul sister-ship of lost lives and the bond kept growing. Clara responded by placing a firm hand on Rose’s trembling shoulder once she stood at her side, in a plain working-woman’s skirt and shirtwaist with buttons not quite aligned. If Rose was indeed first discovering otherworldly communication and instincts that Clara had fielded all her life, it would be a confusing time indeed for her. They needed to be mutual ports in supernatural storms. “I don’t suppose any of you have any idea what woke us,” Rose asked, her voice shaking. Clara’s blood chilled when she finally noticed the contrast. A sequence of ink-black forms lay off the port side like an artificial horizon line. It wasn’t the first time they’d seen such lightless things; Beauregard Moriel had a whole army of Summoned, vile presences that had slipped through a fissure he’d created between the natural and unnatural world. These shadows were no more welcome here than they had been marching up Embankment with the aim to tear down the stones of Parliament. “They appear to be inactive. Summoned and awaiting orders?” Miss Knight queried, studying the predators. Evelyn began to softly murmur scripture used in exorcisms; simple renunciations of devils and evil. Clara imagined that Evelyn’s words lessened the opaque density of this pitch-black armada, but she couldn’t be sure. The bright night sky seemed to be playing surreal tricks on her; Clara didn’t feel her regular faculties of sight could be trusted. Clara placed her hand on Rose’s shoulder and she could feel her tension ease. They had that ability to balance one another, their souls always had. A strange tearing sound to Clara’s right sent her whirling, nearly knocking into the woman who appeared suddenly from around the side of the tall stack as if propelled by an engine. “What the bloody hell?” the woman exclaimed. The voice was familiar, as was her small stature and great presence. “You…” Clara said to the woman known as the Visitor, who had appeared in heraldic capacities throughout her life like some combination of philosopher, guardian angel, and prophet of doom. Known to some as Lizzie Marlowe, she was inexplicable. A woman of sharp angles, a petite redhead with a braid down her side, she was dressed as a proper Victorian explorer, in a thick white blouse, a split skirt, boots, and a seaman’s cap. A peculiar belt of instruments wrapped her waist. Clara peered at the devices—was that an astrolabe? “Why am I here? What have you done, Templeton? This is 1882, yes?” Marlowe barked. She looked the women up and down studiously, her gaze softening only once she seemed to recognize them. “What do you want with me?” Clara asked. “You know, you’re a bit demanding, my dear,” Marlowe admonished. “I think I learned that from you,” Clara countered. The visitor loosed a deep chortle. “I’m so proud. But you must have brought me here for a reason, so let’s discern it, shall we?” She gave Clara and her companions a curt smile and angled her head towards the sea, narrowing her eyes at the eerie glow of the horizon line. She slowly turned completely around. The howl changed, as if incorporating the ting of the brass, as if it were two notes in a reverberating chorus and the visitor made a face of supreme distaste..
“Before we take on those dreadful forms out there, where exactly are we?” she asked. “In the middle of the Atlantic ocean in the middle of the night during a full moon in Jupiter,” Miss Knight said, pursing her lips and striding toward Marlowe and Clara. The three ladies were left to stare at one another. “She’s not a ghost, yet I cannot get a sense of her,” Knight muttered. “It’s maddening. She burst into our Omega offices once, then vanished without leaving a trace; I thought if I just had another chance, I could see what I’d missed. It seems that she is beyond my gifts,” she finished, unhappy at being bested by this mystery. “I’m relieved someone else has finally seen her,” Clara confessed. “I used to think I’d gone mad whenever she came around. She’s been… an infuriating mirage my whole life, flitting in and out at the most critical and dire moments. Not at all how I imagined a guardian angel, but then again, I’ve not led a normal life, I doubt I’d be assigned a normal angel…” She finished with a weary little laugh. “Ah,” Miss Knight murmured. “Astral projection. Yes. If that’s the case, well. Incredible.” Her tone now a bit jealous. Rose was silent, staring, baffled, in the direction Marlowe had gone. A sharp and logical woman, Rose would find no solace in gifts that offered a range of vagaries. Marlowe soon strode back toward them, brandishing a chart that flapped in the wind. Clara wondered if she’d snatched it right out of the captain or first mate’s protesting hands. Marlowe spread the wide paper atop a small table that sat between two deck chairs. As the others gathered around, Marlowe seated herself and began pointing. “We’re here,” she said, placing an ungloved finger at the center of the ocean between North America and Europe. Dotted lines arced across the chart, denoting sea lanes and major currents. “Can we convince the captain to change course?” Evelyn asked. “Yes, there’s an echo,” Clara stated. “It’s not the only line across the waters. There’s all these,” she danced her fingertips over the cartography. “What lines?” Clara asked, finally exasperated. Rose opened her mouth and as a small sound of protest issued forth, Marlowe batted her hand. Marlowe smiled. When she smiled it was alternately endearing and terrifying, as there was something nearly ancient about the expression. Marlowe was too human, too much of one all at once. She was overwhelming. “Ley lines are the… latitude and longitude of magic?” Rose asked, grasping for purchase on the topic. “Life-force, energy lines so powerful they are nearly supernatural,” Clara offered. “Yes. Can you feel those lines?” Marlowe asked. Clara reflexively thought to ask what sense she should sharpen but remained silent when she knew the answer would be her sixth; the maddening sixth, knowing without being able to prove how in common terms. But if there was one thing the Eterna commission had demanded of her, it was that she stop second-guessing that knowledge and begin treating it with proud certainty. There was a long pause. All Clara could hear was the water, see was the endless horizon, smell and taste was a salt-wind, and feel was that moist wind on flushed cheeks and the sensation of a speeding vessel beneath her steady feet that had no trouble with the pitch and yaw of the boat. As for her sixth sense, Clara wasn’t sure what indicators to consider. She could feel Elizabeth staring at her, through her, perhaps seeing more of her than even she could. It was terribly disconcerting, everything about the visitor always was; she made no sense to any of her senses, especially not her sixth. Very often her sixth sense was a hybrid of other senses, a slight tweak to her hearing or a flicker to her vision. The visitor suddenly smacked her in the abdomen. Clara yelped. Had she been wearing her corset it would have been like hitting a cage considering the steel bones, instead, being in only soft layers and with her body on high alert it had a higher impact. Clara stared at this unprecedented, unpredictable woman and faced the prow. The hairs on her head rose a bit and there was a visceral stirring sensation within her. She felt her left hand lifting, pointing forward as they headed west, every movement coming from that visceral place. Her body flooded with a warm, luminous power. She smiled, unable to help herself. She could, in fact, feel this line. There was an audible component too. Something soft lifted from this peaceful thrall, a thrumming, vibrant hum that was not the steam engines, not the water, a faint violin string in vibrato across the waves. “The Trans-Atlantic cable ringing with a sour note, comparatively,” Clara finished. Evelyn, Miss Knight and Rose had all been listening at a polite few paces off, but Evelyn took a step forward, Marlowe’s nearest rival in terms of sheer force of presence. “The force of the world doesn’t like to run on man-made wires but goodness if mankind doesn’t like to run along the force of the world,” Evelyn offered. “If that’s not the truth, I don’t know what is” Marlowe murmured and looked up at the stars. If Clara wasn’t mistaken, the one towards which the visitor stared winked out. At this, the strange woman frowned, as if personally wounded. She turned fierce eyes upon Clara. Clara thought of her lives, lives she could see at any point if she concentrated hard enough, lives that each chewed upon an important crux. She had a sense the Lines were her crux, the one that this life hinged upon. There was a truth to the visitor’s idea of a broader consciousness. At that moment came a gust of wind so strong and sudden that Clara had to close her eyes against the salt spray. When she opened them again, the visitor was gone. While she’d been focused on Marlowe, Rose had gone to their cabin to retrieve the doctor’s bag filled with protective Wards. At Rose’s side walked Senator Bishop, an additional bundle of Wards in his hands. Tall, striking and distinguished, dressed in a black satin robe, his silver hair now positively glowed in the moonlight, giving his distinguished face a preternatural halo. The moment he caught sight of Clara, his eyes sought out hers and spoke volumes of his care. She moved to meet him nearer the door he’d entered from, the magnetism that had grown between them was dizzying and she put her hand on the rail. He turned to nod out at the water and the still-floating shadows. “They woke me too, a thrumming racket in my ears and a dread press on my heart. I have to imagine anyone with even rudimentary Sensitivities either won’t be able to sleep or will have a miserable set of nightmares to show for it,” he said grimly. His deference and respect, his radiant smile, as if her rising to leadership was the source of his greatest pride, moved and inspired her. Her fingers ached to touch him but she had to recall herself to the moment and task at hand. “All the more quickly for extra hands,” came another voice from the deck door directly behind them. Harold Spire, the leader of London’s Omega division, ‘a policeman turned circus manager’ as he termed himself bitterly, strode towards their number, dressed in shirtsleeves that accented broad shoulders and an open waistcoat that mirrored the company’s haphazard dress. Brown hair mussed, the default scowl of the dour man was affixed until he saw Rose step out from behind Clara and his expression softened. “Have you worked around us Sensitives long enough that the presence of the paranormal affects you as it does us? Drawing you to the front lines?” Clara asked with a hopeful smile. “Cluck, cluck,” Black said with a small laugh, his turn to speak from the doorway, his own box of Wards in hand. An immaculate, handsome, fashionable man who usually dressed in light colors, patterns and pastels, a stark contrast to the darker and bolder shades of most of the rest of the teams, Lord Black was presently arrayed in an emerald silk smoking jacket with a loose cream ascot, looking far more put together than the rest of them. Wards were distributed among the group. “We’ll affix them inconspicuously how?” Spire asked. Rose lifted up a small box of twine, cloth and scissors. “Miss Everhart again wins the day with usefulness,” he stated. She beamed and Clara could feel the little ripple of light and warmth that resulted. Energies and moods were atmospheric conditions and despite Spire’s thick clouds of skepticism, his deepening bond with his second-in command made for clearer skies. The small glass tubes were mostly filled with London’s protective recipe and a precious few still held New York’s ingredients; Clara hoped they would work here, in the middle of the ocean, for both shores. Without a word between them, Miss Knight and Evelyn began lashing Wards to various out of the way places along the prow, Lord Black, Rose and Spire went aft and port. Clara instinctively went starboard, towards the Ley line side, and Bishop followed. They were silent, knowing that prayerful contemplation was the best way to attend to their work and to charge the Wards with their own personal fire. She felt the Wards vibrate in her hand as if invigorated as she neared the ship’s rail. Once she’d tucked two of the glass tubes into a notch in the wood, striking a match to light their contents, satisfied by the ethereal light that burned in the glass, she reached out to feel the Ley line again. It was like it was singing within her. As she felt it, she turned port side. In the distance, one of the wavering, inky humanoid shapes hovering above the Trans-Atlantic cable faded into the bluer night sky. Clara smiled. Magnifying the Lines within her, an amplifying resonance, there was an effect. The full line of shadows were gone and she heaved a sigh of relief. The rest of the team had vanished, leaving her alone with Senator in what likely was a message of encouragement. No one could doubt what an indomitable partnership Clara and he had become. “Do you believe in Ley Lines?” Clara asked finally. “Thank you for being so very good to me,” she said, turning to him, intuiting that his touch invited closer contact. “You have kept me good all my life,” he said earnestly, keeping the hand on her shoulder but sliding his other around her waist, as if he were about to dance with her. “And… now?” she asked, tilting her head to him. Just what kind of power could she wield indeed? His fingertips inched down her back and further around her side, beginning to envelop her in a covetous embrace. “I want to be very good to you indeed,” he murmured. She let herself fall against him with a soft sigh as his arms fully enclosed her, having longed for a kiss since the last night at Lord Black’s estate. There, something definitively changed between them; an agreement that she would carefully open herself to feelings buried deep in her heart. In that compression it had become far more precious, a diamond waiting to be mined. A laugh sounded around the side of one of the great steam stacks. At the sound, Bishop turned his face, taking a step back and letting his arms fall away, breaking what had been the promise of a kiss, ever the gentleman of public propriety, offering Clara an apologetic look. She turned to the noise to see Louis’ twin, Andre Dupris and Eterna’s best spy Ephigenia Bixby deeply engrossed in conversation, dressed as though they’d not yet gone to sleep, Andre in the navy evening suitcoat he’d worn to dinner and Effie in a white linen dress with ribbon trim, her tight brown spiral curls tucked up under a felt and feather hat. The two had partnered together in England, sliding between classes and cultures, saving as many lives of the struggling together as they could, striving to keep them from the Masters Society’s vile clutches. The moment they made out the figures at the side of the ship as their compatriots, Effie gasped. “Indeed,” Andre intoned with a slight, knowing smile that made Clara blush. “Ever since the nights trying to convince the dock workers not to work for Apex, trying to warn as many of London’s underclasses of the dangers as possible, we’ve not been able to keep regular hours and find ourselves pacing the night,” Effie confessed. “I was awoken by the sense of Summoned forces and we’ve just been Warding the ship,” Clara offered. “But perhaps we should all try again,” Bishop stated. “I think our Warding has made the night sing more sweetly.” He bowed his head. “Until morning, friends, for soon we are home,” he said, and walked off with a lingering look at Clara before disappearing beyond the door to the cabin halls. “Goodnight,” Clara said, casting one more glance over her shoulder at the water before striding ahead to the deck door, hoping to catch Bishop in the hall beyond. But he was gone into his room, and she didn’t dare pursue him there. Not yet. Lying in her bunk, Clara drifted to sleep with an unresolved question on her mind, wondering if her new skills of Ley line sensitivity would increase the likelihood of epileptic attacks. If fully attune to the great dynamos of the earth’s life force, would she be paralyzed in the face of danger? With every gift there came physical consequences and she prayed she wouldn’t suffer unduly in the process. On-sale Nov. 14, 2017 from Tor.